I took Rap out for his first trail ride on Monday and he did great. 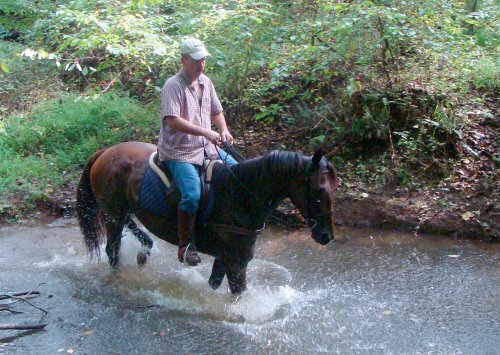 We have several trails that include hills, creek crossings, ditches, logs, etc. and he passed his first test with flying colors. I took him out by himself (therefore no pictures, sorry) and he took everything in stride. He “eyeballed” a couple things, but had no “big” problems. I just wanted to take a minute to let you know that Rap is coming along just fine. I also wanted to congratulate you and Barry on “selling” so many horses lately. I have been keeping an eye on your website and am glad to see all the success you are having. I wish you both much continued success in your endeavor.